There was a time when Chiyaan Vikram's movies used to get sold for 12 to 15 crores. But because of his back to back disasters, Vikrams market faced a drastic downfall. In the past, most of his movies used to get dubbed into Telugu. But now only one or two are getting dubbed and released in other languages. The trade is even saying that it would be great even if movies are sold for two crores. Despite the low-market, the dubbing rights of his upcoming movie 'Swamy' got sold for 8 crores. 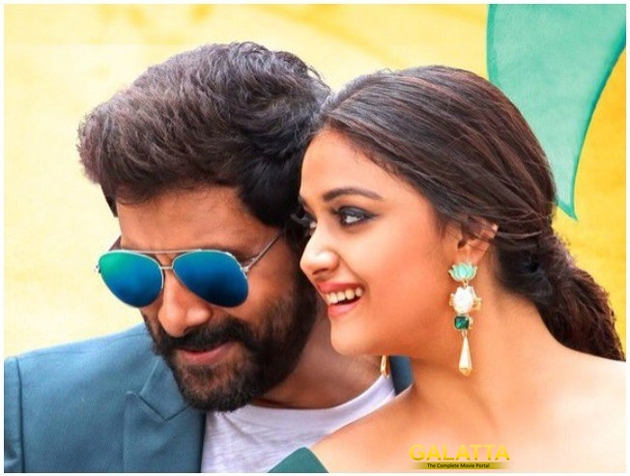 Interestingly, the reason behind this is not Vikram, but the female lead Keerthy Suresh. The actress got popular after 'Mahanati' and as this is going to be her next movie, the audience are also interested to watch the film. The other reason behind this would be director Hari whose 'Singam' series has greatly impressed the audience. Though the third installment of the movie failed to score big at the box office, the mass audience will definitely connect to his films. So, considering these two factors the movie got sold for 8 crores. Also, full length mass movies are not getting released in Tollywood these days. So, the people who want to watch such films are eagerly waiting for the 'Swamy's release. Let's see if this movie can bring back Vikram's star image or not. Sankranthi Marks Start Of Koratala Next?